Bio: Alexander Verstov was born in Moscow in 1963. 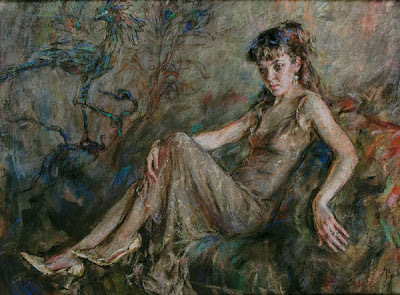 In 1987 he graduated from the Fine Art Department of Gertsen Institute (Leningrad). He became a member of the Moscow Artists Union in 1998. His progress in the world of pastel has been inexorable. In 2002-2003 he participated in the Europastel exibition (Italy, Russia) and he was an award winner at the Salon International du Pastel (France), in 2004. He was participant and organizer of the first Moscow International Pastel exhibition in 2005 and in 2006-2008 took part in the IIIrd International Pastel Biennale (Poland). Navigation: Main menu remains available at top of page. The site is bi-lingual, Russian and English. Gallery: Main galleries: Pastel and Oil. Sub-galleries: Portrait; Flower; Landscape; Composition. Image View: Each sub-gallery contains thumbnails that enlarge to give details and may be downloaded. The enlarged image is part of a slideshow series; use the arrows to go forward or backwards, or the PC’s back-button to return to the page. There may be more than one page per sub-gallery. This picture is 600x442, 83 KB; the original is 73x98 cm.